This will be the last post from the Galapagos as tomorrow we are setting off on the longest passage of our journey. We will have been in the Galapagos for just less than two weeks which is good.We are about a week behind my schedule but it allowed for almost 3 weeks in the Galapagos. That means that with luck, I will have caught up the lost time. I went diving on Easter Monday. 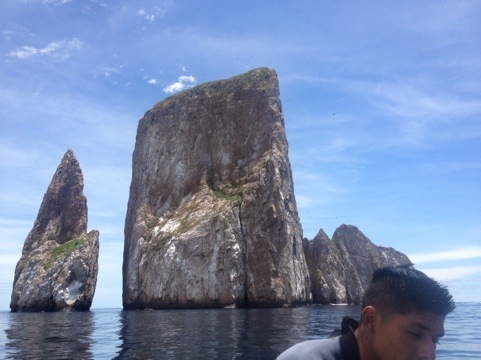 I have always wanted to dive here and booked a two dive package to dive Kicker Rock. It turned into a three dive package because, as my last dive was 5 years ago, I had to do a qualifying dive to prove I still knew how to do things. For anyone reading this that can’t dive, I would encourage you to learn at the first opportunity. The world under the waves is absolutely stunning and you really can’t take it all in because there is just so much to see. It is a pretty spectacular dive site as you can see from the photo. The rock itself rises from unfathomable depths. Where it is split, there is a channel that is about 55 feet deep. We went through that channel and then did what is called a wall dive at about 60 feet around the outside. You are suspended there and when you look down there is no bottom. Sharks, black tip and white tip reef sharks plus a new one for me , hammerhead sharks up to two meters long! Fortunately, the sharks are pretty shy and do not come close up. When you see them, they tend to veer off into the shadows and disappear. You kind of have to believe that they are not out to eat you or else you would freak out. Turtles. Lots of different species. On the two dives I must have seen about 30 in total. I have never been anywhere where there has been so many turtles. At one point I could see 5 at the same time. They are quite tame and you can swim up close and even touch them. Giant spotted eagle rays. These things are enormous, about 2 meters across and fly in a leisurely way through the water. I only saw one but it was fantastic. Sea lions. Yes, one came swimming past right beside me 70 feet down. Probably the same one that released my tuna last week! There were tons of other slightly less spectacular things to see, like moray eels, parrot fish, groupers, napoleon wrasse, big big clown fish etc etc. It was truly fantastic and despite being only half a degree south of the equator we had to were wetsuits because of the cold currents that bring all the food that attracts all the wildlife. You could really feel the different temperature layers. There probably will not be any posts for a while now. It takes about one month to sail to our next stop. Wish me luck. More later…. Good luck on the long leg ahead, enjoy the journey. Hi Willie. Good to see that all the skippers training Sturge and I put you through is paying off! I’m sure there will be a time when the Hosey knot will come in use. We were getting a bit worried with the formation of all the ministries…it sounded like the start of a Lord of the Flies situation. Having sailed with you for a week and enduring your snoring, I was surprised that your current crewmates hadn’t made you walk the plank yet. Sounds like a great adventure and we’re following it with interest. Keep enjoying it and look forward to more updates.